Ditch the beer, airlift an apple tree into the courtyard and sell plenty of cider, and you have yourself a cider garden. Hotel Wright Street is the first pub in Adelaide to grasp the cider graze by the bottle-neck and give us a dedicated place to drink refreshing local brews. There is a fantastic selection of ciders to choose from, Bulmers on tap, many in bottles, and a house scrumpy cider from the Adelaide Cider Co, poured from an enormous wooden barrel – a must with ice. They support local Lobo and Adelaide Hills ciders, as well as stocking some intriguing foreigners, including the recently awarded Napoleone & Co. cider (which shared first place for best pear cider in the Australian Cider Awards 2011), all the way from Melbourne, and a Welsh scrumpy called Happy Pazze. Of course, they also stock Dirty Granny cider, deemed the Best Australian Cider at this year's awards. I decided to branch out and test another local, Houghton's Honey Apple cider. Here, I discovered something delightfully different. The taste of raw honey meets fermented apple and lingers on the tongue without shifting in aftertaste. A fan of flavoured ciders, I hadn't yet tasted something so strikingly complementary to the taste of a traditional apple cider. We really do have some SA talent. This microbrewery also does a Black Apple cider, which caused some disagreement among our cider party. The beer drinkers loved it, the rest of us didn't. Though we agree it's good to have some variety - so long as we don't have to drink it. Now, pass me the Bulmer's Blackcurrent – ahhh, sweet sweet sugar. As far as the physical cider garden goes, there is little to cause excitement. However, when the scrawny apple tree set in its centre grows to cover the whole area, it will be a beautiful place to sit in the summer; "Meet me under the apple tree" will, no doubt, be an oft heard phrase. Myself and my cider drinking crew are eager anticipating it. Why? 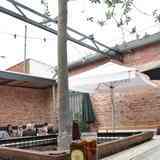 Adelaide's First Cider Bar!